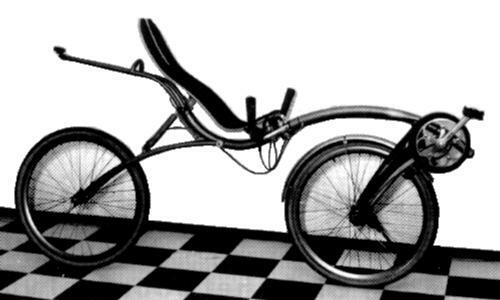 The Chinkara was a Flevo-like bike made from round stainless steel tube. It is considered one of the most beautiful implementations of the Flevo principle. The bike was designed and built in low quantities by Rob Hofman from Swing Cycles in Delft (NL). There were six frame sizes for people between 155 and 195 cm height. It was available with wheel sizes between 20" and 26". Depending on the configuration its weight was around 16 kg, the price was between 4,300 and 8,500 Dutch guilder (~1,950 - 3,860 €). The dropouts of the front wheel could be delivered with an excentric insert to avoid a chain tensioner. The "Chinkara" is named after an antelope which is famed for its speed and agility. Furthermore "Chinkara" approximates phonetically the Japanese word for human-power. The 'Wave': This Flevo version was an examination project at the Academy for Industrial design in Eindhoven. The frame was built from stainless steel tube, just as the Chinkara. A gas filled spring/damper (comparable to office chairs) could be used for stepless height adjustment. The bike cannot be divided, but it can be folded by folding rear fork and luggage carrier forward. 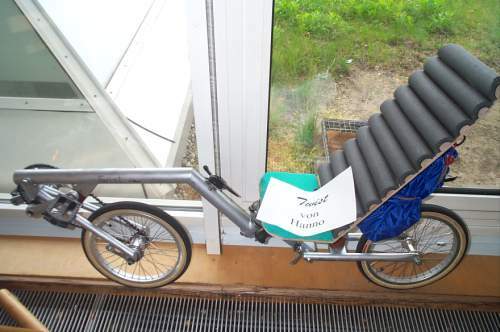 The 'Staiger Air bike': This bike is sometimes called the German Flevo, and it has some resemblance to the ChaCha-bike. But it has been designed totally independant from the Flevo. The bike is only rear sprung, and can be folded to a small package. In the beginning, the production was in hands of the Schmidt brothers, but later it was taken over by the Staiger company. Altogether, about 100 Airbikes have been sold. 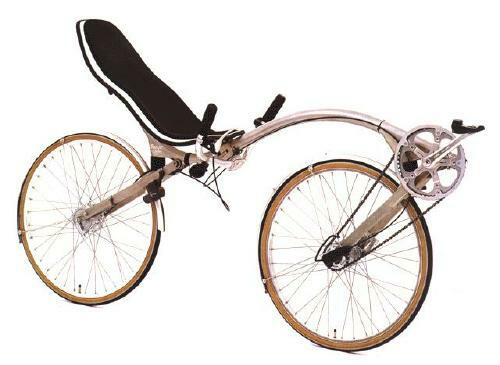 In 1996, the Staiger company got a new owner, and the Airbike production was stopped. It can be folded by dividing it in the middle, dismantling the seat and putting all parts of it on the seat. Then it can be worn as back pack. 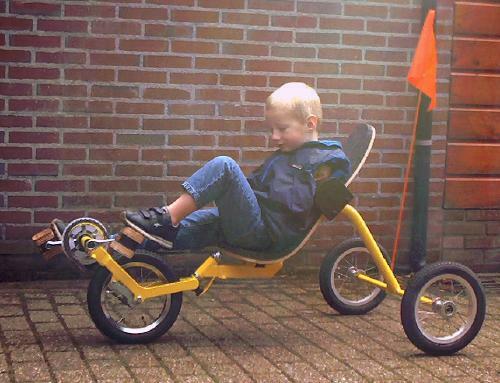 The 'Yepp': This trike has been special designed and built for a boy who has no arms. Because the rear part cannot tilt and the hub has a backpedal brake, he is able to ride it independantly. That wasn't possible with any other bike. The trike has been built by the one person's company Fast FWD. 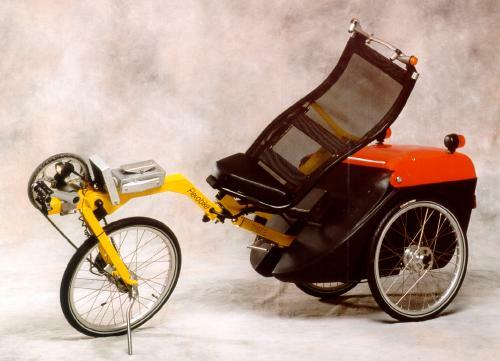 The Flevobike factory has produced 4 trikes for people without arms, in total. This is their latest one. 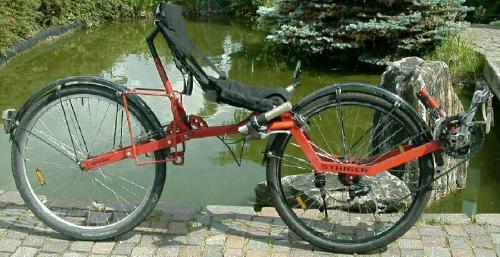 There are very many special adaptations, such as electric gear switches that are switched by the shoulders, direction indicator lights and head lights switched by the ankles, the luggage box with a click close system, a special parking brake with a handle under the seat (leading to the rear drumbrakes), the frontwheel suspension with backpedal brake.